Nation was another book that had been languishing on my shelves for more years than is good for a book. I know the exact length of time I've had it to, since there's a nice little inscription on the bookplate wishing me a happy 17th birthday. I'm 24. I really could've gotten to this one quicker. Also managed to really confuse my fiance, who was stunned that my next read from Terry Pratchett wouldn't be a Discworld novel. Nation follows two children who must overcome tremendous challenges in the wake of a tsunami that hits a small group of islands in the South Pelagic Ocean. There is Mau, an aboriginal boy who was in the middle of his rite of adulthood when the tsunami washed away his village, leaving him with a lot of unanswered, or unanswerable, questions and possibly without a soul. He soon discovers Ermintrude, a British girl who is determined that Standards will be upheld, even if that means serving scones that taste like rotting lobster. Together they must try and rebuild what is left of a proud nation. 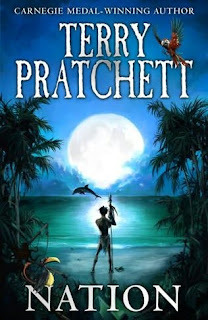 I wasn't sure what this was going to be like since my fiance, an ardent Terry Pratchett fan, had confessed that he was never particularly fond of this one. Might not have even finished it, now that I think about it. Having finished it though, I would say that this is definitely worth your time. Admittedly, it does have a bit of a slow start largely brought about by the two main leads' language and cultural differences, but if you stick with it, I think it has a lot to offer. 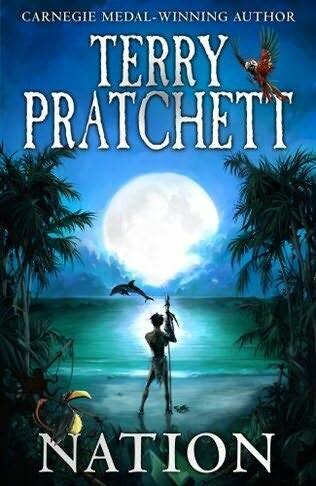 While it may not have as much of the sharp satirical edge or outright ridiculous comedy that Pratchett's work is known for, it does have some really interesting themes that it delves into. There's the constant questioning of humanity's place in the universe (especially in a religious context), with questions like "Why did unintelligent creatures like birds know how to escape the wave, but not us?" used as a starting point. Linked to this is an examination of traditions and how the strict adherence to them can be more harmful than helpful; it's a trait seen both in the aboriginal and colonial British characters to begin with, as both societies are so rigidly drawn, especially in terms of gender roles, that the individual parts played are soon revealed as useless without the rest of society to work around them. It's a surprisingly thoughtful novel, once you get past the necessary awkwardness that culture clash brings about. There's a large part of me that would actually argue that Nation is one of those books that should be part of a child's basic literary education, because it perfectly encapsulates an exploration of acceptance and constant questioning ourselves and our world. And really, that's one of the most important things that you could instill in someone.